Joe Horse Capture led a discussion on Capitol Art in the Cass Gilbert Library, on the Capitol’s third floor. I attended the second of two Capitol Art Tours launched by the Minnesota Historical Society Friday. It was led by Joe Horse Capture, the Society’s Director of Native American Initiatives. A couple of dozen people attended. I learned some new things. I appreciated the dialogue Horsecapture led. I also left with some concerns about the tour — including whether it would continue. 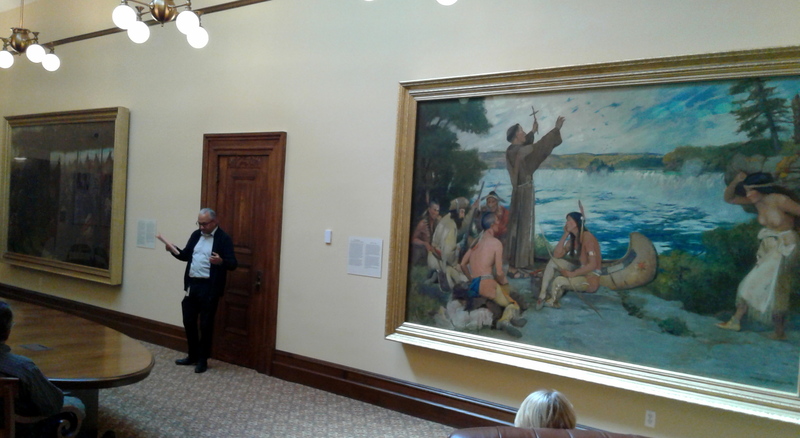 The hour-long discussion focused on two controversial paintings that once hung in the Governor’s Conference Room, one showing Father Hennepin “discovering” the Falls at St. Anthony, the other a painting of the signing of the Treaty of Traverse des Sioux in 1851. I appreciated Horse Capture’s effort to engage people in a conversation around these paintings and whether the paintings should remain in the Capitol. These paintings are offensive to many, notably Dakota people who are inaccurately and offensively portrayed. When these paintings hung in the Governor’s Conference Room, those who found them offensive had no choice but to look at them if they were doing business in the room. Moving the paintings to a low-traffic area allows people to engage them — or not — as they choose. One problem with the “tour” was that it left out the controversial art that remains in place in the Capitol. 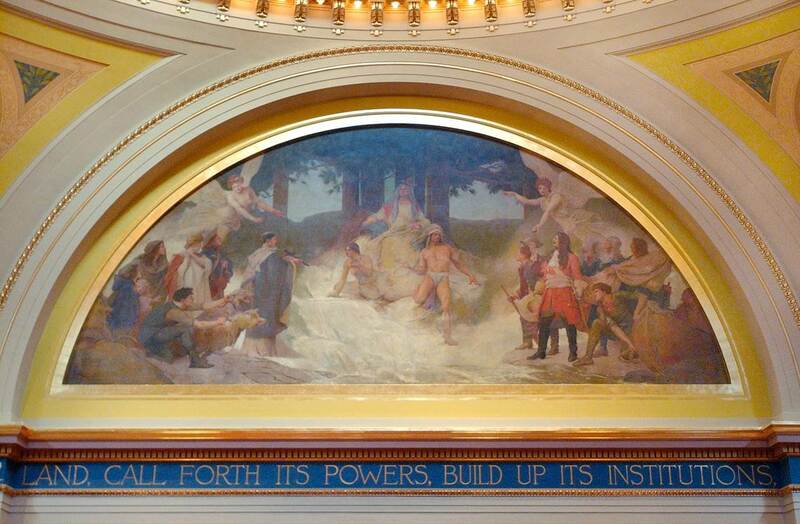 For instance, it did not include images or discussion of the Senate Chamber’s mural “The Discoverers and Civilizers Led to the Source of the Mississippi”. This painting shows the forced conversion of a Native man and young Native woman, who are surrounded by a priest with a cross, snarling dogs, and the angels of civilization and discovery. This is an affront to our deeply held belief in Freedom of Religion. Nor did the tour include the House Chambers, which includes the inscription: “The Trail of the Pioneer Bore the Footprints of Liberty.” For Native people, they had a lot more freedom before the pioneers arrived. 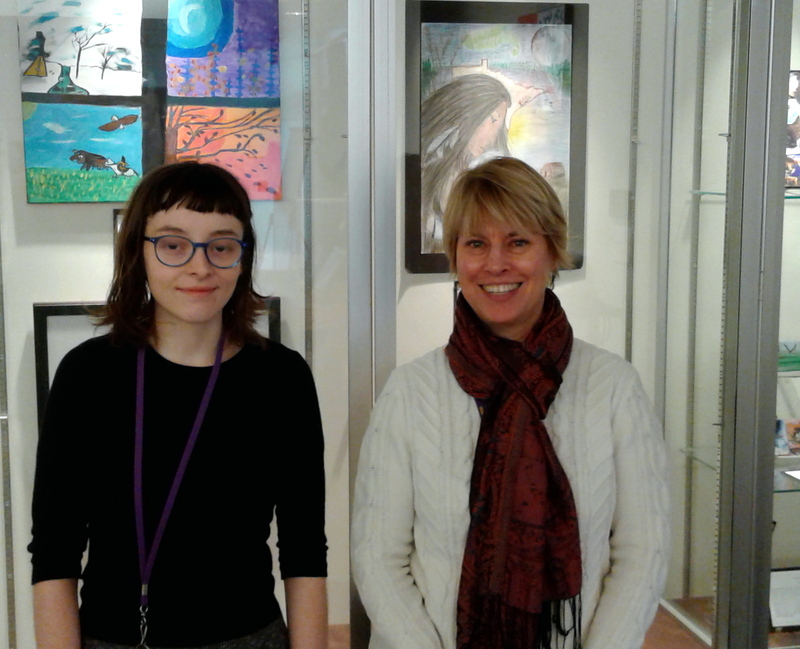 Thanks to Saint Paul Public School’s (SPPS), initial conversations are happening with the Minnesota Historical Society to get student art in the Capitol, according to Sherry Kempf, who works in the district’s Multicultural Resource Center (MRC). The MRC staff has been a wonderful partner in promoting the Healing Minnesota Stories Capitol Art project, which teaches students about the historic art in the Minnesota Capitol and challenges them to create their own contemporary Capitol art. Here is a short video the district created about the project, with footage from an art opening.